How to wash a down jacket in a washing machine or with your hands? How to wash a down jacket in the washing machine and with your hands? 1 Washing or cleaning a down jacket? 6 How to dry a down jacket? Down jacket - perhaps the most preferred version of winter clothing for the Russian climate. This garment retains heat well, looks attractive, and also has an affordable price. However, all the advantages of down jackets overlap the complexity of care. So, a big problem is delivered by the washing of a down-padded coat - in the process the down is caking, in connection with which the product comes into complete disrepair. Fortunately, the right approach to washing will help preserve the original appearance of the product and not incur costs. How to wash a down jacket in a washing machine and by hand, what tools to use for this, and also how to prevent down rolling? This manual will answer all your questions. Washing or cleaning a down jacket? The high cost that with regular service calls can go into a large amount. An enterprise that conducts dry cleaning is usually not responsible for the safety of things. Not every village has a dry cleaner. She can also be far away from home. On the processed clothes there are some chemicals that can cause allergies. Thus, for many people it is better to wash a down jacket in a washing machine. If you also think that home washing is better and you are wondering how to wash a down jacket correctly, do not spend money on an expensive dry-cleaner, but rather read the following recommendations. Sometimes appropriate down jacket wash without typewriter if the pollution is not very strong and have a point structure. If you do not want to face the many problems that appear during the washing of the down jacket, perform a manual cleaning. To do this, it is enough to wet the sponge with soapy water, process the stains in this way, then dry the clothes. As a rule, this treatment is enough to completely remove small and frivolous stains. But how to wash down jacket in case stains have already penetrated deep into the fibers of the fabric? How then do? If down jacket with a fur collar or other inserts, unfasten them before washing things. Securely fasten all the zippers and buttons so that they do not come off in the process of washing. Disconnect all metal inserts, if any (may oxidize during washing). Turn the down jacket on the wrong side and gently straighten. Also, before washing a long down jacket, make sure that the seams on your clothes are sturdy and do not let the fluff out. Otherwise, after washing you will find your thing pretty shabby. If there are taped places on the down jacket, it is advisable to avoid washing in the washing machine, while preferring hand washing to it - the glue may lose its strength, the clothes will simply fall apart when washing. Do not use washing powder. Even a good washing powder can lead to the formation of unpleasant and difficult to remove stains on the surface of the fabric. How to wash a down jacket in this case? If you are interested in a quality result, you will have to spend money on a special tool for washing down jackets. You can find such a tool in a store that sells sportswear or household chemicals. It is not so difficult. Wash in a vertical condition. If you have the opportunity, when washing keep the down jacket in limbo. In this case, you will need less time to rinse. When you finish the wash, rinse the down jacket without removing it from the gimbal, then leave it in the same form, but for drying. Also, do not allow the fluff inside the clothing to clump together. Take proper care. Do not expose the down jacket to aggressive effects, wash it as carefully as possible, so that the down inside is not crumpled. Otherwise, there will be problems. Как wash the down jacket with your hands in the basin? To do this, pour warm water into the container (temperature from 30 to 40 degrees), dilute a small amount of special laundry detergent in water, and then soak the down jacket in water for 10 minutes. Next, rub the cloth with a soft sponge or brush, rinse the thing and let it dry in a suspended state (preferably in an open space with air). For one cycle in one washing machine, only one down jacket can be washed. Before you wash the down jacket Etson and others, pull out all other dirty things from the drum of the machine. Put several large tennis balls into the drum of the washing machine (not small white ones, but rather large green ones with stripes). Such a simple action will completely eliminate the possibility of down rolling, which can lead to very big problems. The washing temperature should not exceed 30 degrees, so that the product is not damaged in the process. The wash mode should be set to “Hand wash” or on any delicate mode. How to wash in a typewriter down jacket so that the subsequent drying does not cause any problems? To do this, after the main wash, spend a couple of rinsing in a typewriter. This will allow you to thoroughly wash all detergents, which, after washing, are firmly fixed on the fabric. Down jacket can be washed without spinning in a washing machine as usual, but you will have to pay more attention to drying. Also ensure that the spin is set at the 600-800 speed. How to dry a down jacket? Take a down jacket by the hem and gently hang it on the hanger, preferably in the open air or indoors with good natural ventilation. Give the down jacket the desired shape. In the process of drying a down jacket, regularly check the condition of the fluff, if necessary, push and distribute it evenly over the entire volume of the jacket. If you need to dry the product quickly, blow a down jacket with a hairdryer from the wrong side. Make sure that in the process of drying the down jacket, there are no heaters and batteries turned on, as excessively forced drying can lead to a negative result - the appearance of white stains. But if the divorces did appear due to your indiscretion, you can remove them with a damp cloth - carefully clean the dirty place by removing the divorces. Now you know how and how you can wash a down jacket, both with your hands and in a washing machine. Clothing should be used carefully, as the washing of the down jacket is recommended not more than twice a year. Use only proven and reliable recommendations, so as not to spoil your clothes! Clothes are stained by washing - we solve the problem! 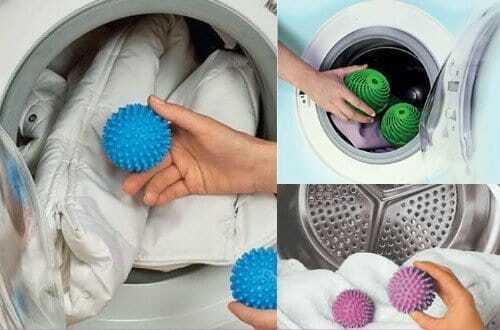 Balls for washing down jackets - how to use? Proper washing, drying and ironing a terry towel! Once I still got my feather coat dirty, I didn’t know what to do with it, how to wash it. I had never been able to imagine that the down jacket can be washed in a typewriter. I was afraid that the fur rolls up, knits. And ran quickly to hand over their thing in dry cleaning. They called me a large sum, but for the sake of a dirty down jacket I was ready to fork out. I took it in a week and I started having a severe itch. I knew all my life that I was allergic to chemistry. I did not go back to the dry cleaning, I hardly would have paid me the money. And then I read about the amazing and VERY useful advice. It turns out that you can wash a down jacket in a typewriter! The next time when it becomes dirty, I will definitely wash it at home. Yes, in the dry cleaning every time to wear a little expensive and spoiled me there already a couple of things. Now I wash in the washing machine in the delicate mode. I tried tennis balls, but this method did not suit me. Now I buy products for UniPooh down jackets and wash them with them. The main thing is that the filler then straightens itself out and does not need to be whipped. Well written. I now constantly suffer with feathers. Husband speaks in dry cleaning, so expensive. There are three of us and everyone has 2-3 things, how much money you need to pay for dry cleaning. Pro tennis balls in life itself would not have thought of. Need to try. Well, when there are such articles - after reading any teapot, you can do everything correctly. Take note. Thanks to the author!